It’s a beehive! It’s a garbage can! No, it’s… a 150-foot high chunk of meat on a spit? Yes, the rumors are true. Hudson Yards, Manhattan’s new $25 billion development — AKA elitist neighborhood — just unveiled its central art piece and, as Eater NY pointed out, it looks exactly like one of Israel’s most iconic street foods — the delectable shawarma. Thomas Heatherwick, the mastermind behind the 15-story climbable sculpture, didn’t set out to make the world’s largest rotating meat-on-a-stick. Inspired by ancient Indian steps, the artist dubbed his $200 million dollar adult jungle gym “The Vessel.” Unfortunately for Heatherwick, no one else will call it that. Because it’s clearly a sculpture of shawarma. Granted, it would be unfair to neglect the myriad of other comparisons New Yorkers have made to Hudson Yard’s art piece. The New York Times called the “big, bold and basket-shaped” structure “the city’s biggest Rorschach test,” and the Washington Post touted The Vessel as “a massive, honeycomb.” But, let’s be honest — any sane person knows that it resembles the savory, juicy, well-seasoned chunks of meat you can find on display at practically any Middle Eastern food truck in Manhattan. The Vessel (*cough* The Shawarma *cough*) is free to the public as long as you reserve a ticket in advance. Will it rival The Highline in Chelsea? Probably. Because, again — the instagrammable collection of 2,500 Italian-made bronze and steel steps is the greatest ode to shawarma the world has ever seen. 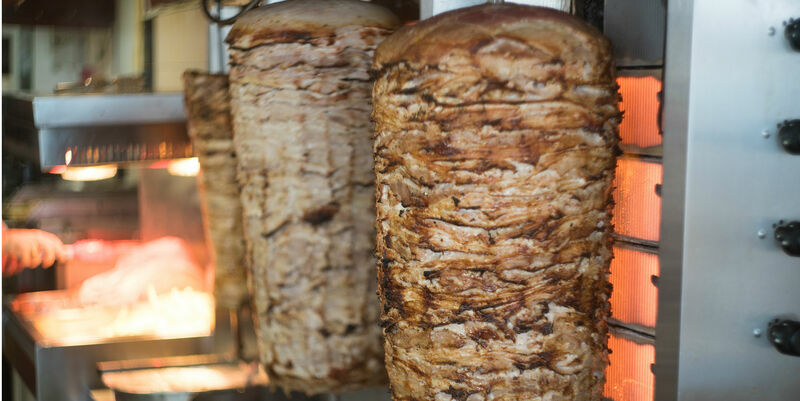 Craving shawarma? Try our cauliflower shawarma rice bowls. This beloved Jewish deli just opened a new bar.